Phil Jackson, Steve Mills, and Jeff Hornacek stand by their newest Knicks, Joakim Noah, Courtney Lee, and Brandon Jennings. 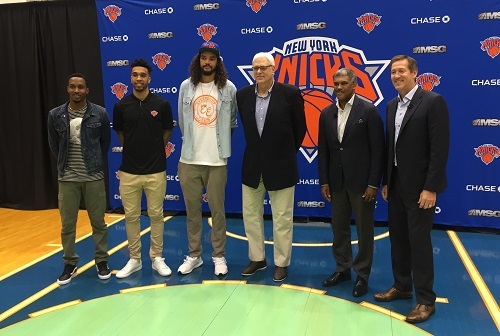 The New York Knicks’ and Phil Jackson’s whirlwind offseason continued yesterday with the introduction of 3 new signees for the Orange and Blue. After Derek Rose’s induction a few weeks ago, his former teammate and New York native Joakim Noah, Courtney Lee, and Brandon Jennings spoke with the media. Before that, Jackson, along with Steve Mills and new Head Coach Jeff Hornacek, held a press conference to discuss the new additions. Jackson expressed his belief that this new roster holds more experience and more of a competitive edge which could help with being competitive in the East. However, he would not make an exact prediction on where his team would finish. To listen to the full press conference, click play below.